UPDATE: *Unfortunately, RUB BBQ shuttered in late 2012. Their burgers will be missed! With each year that passes, the New York culinary landscape evolves. Certainly, the past few years have been no exception. A focus on quality, less frills and more taste has foodies including us at Burger Bedlam caught up in the great new offerings we encounter daily. Particularly due to the sluggish economy, chefs and restaurateurs must now compete harder than ever for foodie affinity with food trucks, stands and pop-up shops. Less decadent meals and a focus on light but tasty bites also helped spawn an intense burger craze around the boroughs. Obviously, such a trend allows our search for the best burger in NYC to assuredly reach new levels of burger bliss. Hopefully, as a result, we’ve become more discerning than ever, allowing our site to make judgments that although subjective, are fair and accurate. 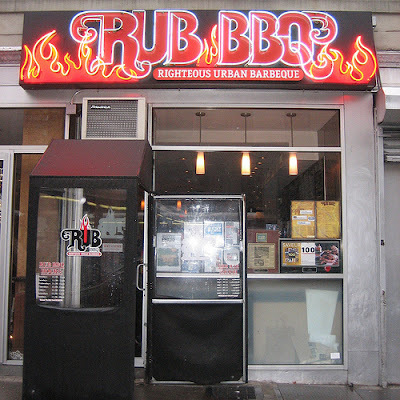 Yet, prior to our foray into the business of reviewing burgers and before our city faced economic challenges, the owners of our next review, RUB BBQ in Chelsea, were in the game. Offering delicious BBQ to New Yorkers since 2005, owner Andrew Fischel and his crew, including notorious BBQ Master Paul Kirk, had already won the heart and stomach of our good buddy Rev at Burger Conquest with their RUB Burger (along with the vast menu options as well – burnt ends, smoked BBQ turkey or pastrami anyone?). To quote Rev, “it’s pure divinity.” As you might imagine, such praise had us amped for a taste, albeit with open unbiased minds and empty stomachs. Our Expectations: The RUB Burger. About a 5 ounce patty (composed of burnt ends, short rib and brisket), Velveeta cheese, caramelized onions, a chipotle based special sauce and a few sliced pickles all on a Pepperidge Farm bun. With a focus on freshness and basic ingredients, the RUB Burger description had us salivating. Offered only on RUB's weekly Monday Burger Night's from 6-9PM and akin to the fast food style burgers we’ve eaten aplenty, this one sounds like a winner from a conceptual standpoint. Meat: Cooked on a skillet and masterfully done to a medium rare state, we were amazed by the temperature execution considering the size and shape of the patty. Often times you’ll see a thinner patty such as this one inaccurately prepared. Thankfully, the RUB Burger was on point, exemplified by the perfect outer crust and beautiful char. Ground daily, the melt-in-your-mouth texture and freshness were key cogs in the scrumptious taste of the meat. We always make a case for the patty on its own, taking a bite without the toppings. Importantly, this burger aced the test as the cut combination yielded the fat content we desired. Supreme flavors engulfed every bite with a salty and expertly seasoned portion of burger meat. Can’t say enough about that char. Toppings: Well balanced and devoid of pretentiousness, the toppings provided the messy but tasty compliments we hoped for when combined in a bite with the almost perfect patty. Velveeta cheese was a unique choice, as RUB eschews the ubiquitous offerings of most establishments. It was creamy and suitably melted. Though, we may have more so enjoyed the sharp taste of American or Cheddar cheese since the chipotle based special sauce was just as creamy. Finally, the caramelized onions were sweet while not terribly oniony and the pickles contributed another sweet, crunchy texture. Bun: Whereas the preceding two ranking categories hit the nail on the head, we were disappointed in the choice of bun. With all the makings of a top notch burger, a Pepperidge Farm bun – straight off the grocery store shelf – had us scratching our heads. Sure, it amply covered the patty with a fitting burger to bun ratio, but it didn’t offer any substantial qualities. Lacking on taste, the bottom half of the bun ended up like a wet blanket. A bun needs to compliment the burger its housing, not detract from the eating enjoyment. Still, we’ve had worse but can’t help to wonder what a potato roll would’ve done for our review. Meat (50): A glorious balance of fat content from the burnt ends, short rib and brisket with a superb char and crust that makes our mouths water at the very thought of it. Freshly ground with great texture. Toppings (24): Savory and sweet with plenty of balance while supplying abundant flavor. Though not thoroughly suited to our liking, Velveeta was a nice deviation from the norm and the special sauce added creaminess despite the slight redundancy in regard to composition. The onions added pleasant crunch along with the pickles. Bun (17): A head scratcher, the bun had one main thing going for it – the size. Suitable coverage of the patty but neutral taste and a soggy bottom half had us irked. We admire RUB’s aim to keep things simple, but a touch more effort could have gone a long way.